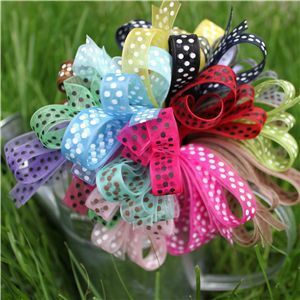 These ribbons are EXCLUSIVE to Crafty Ribbons, we have had them printed just for us..
We selected the most popular colours from our Grosgrain Swiss Dot Collection and had them made in this delightful organza ribbon. There are 23 colours in the collection, 12 ribbon colours are printed with the classic white dots, 6 are printed with black dots and another 5 are printed with brown dots. The ribbon is 10mm wide with the dots printed onto the top of the ribbon, if you run your finger across the ribbon you can feel the dots. All the colours are available in 3mtrs lengths or on 20mtr rolls. If you are unable to choose your favourite colours then why not go for the WANT IT ALL Collection 1 mtr of all the colours!. 3mtrs of the same colour ribbon for £1.00 or any 6 colour bags for £5.00 - that‘s 27p per metre, so not only great ribbon but a great price too! !